Mission Statement - "Clemson Area Transit (CAT) is dedicated to excellence in serving everyone with safe, friendly, and reliable public transportation." 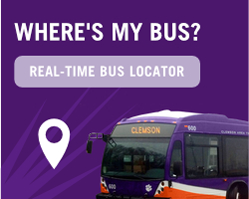 Campus Parking Shuttles - Clemson Area Transit (CAT) and C.U. Parking & Transportation Services have coordinated shuttle service for your convenience. Security Matters - "Clemson Area Transit (CAT) is dedicated to excellence in serving everyone with safe, friendly, and reliable public transportation." Where's My Bus ? "Real-Time Bus Location"